APPLICATIONS IN POLISH ONLY !!! Instead however, it is a huge disappointment and missed opportunity, that ONLY submissions for nominees submitted in Polish will be accepted, thus depriving a large proportion, arguably the majority of foreigners in the community the chance to easily propose worthy nominees, which fundamentally devalues the whole process. The translation of the procedure (card and application) is for information purposes only. In accordance with the applicable regulations prevailing on the territory of the Republic of Poland, only documents submitted in Polish language and on the original forms have legal effect. Documents submitted in a foreign language should be translated into Polish. 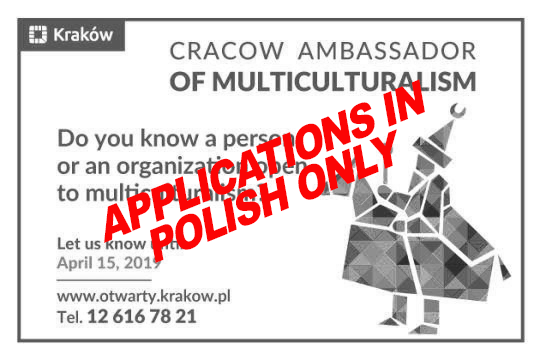 In effect, if you, as a member of the Kraków community, wished to submit a proposal nominating an individual or group then you need to be able to write in Polish, or hope to have a friend who can give up the time to translate your application or pay to have it done. “Unfortunately, despite our efforts, the document that we submit to the Multicultural Ambassador must be in Polish and on the Polish form. We can not change it because this is the Polish law. For our part, we will be assisting in translating and volunteering by our office. We also hope that Team members will be helpful. Please send us your texts if you can not find anyone who will complete the form in Polish. Whilst the above response indicates that there will be some assistance given for forms submitted in languages other than Polish, this ‘work around’ has not been published, notwithstanding the above kind offer to help with translations, the official policy and directive remains unchanged. It’s encouraging to see that the Otwarty Kraków team seem to understand the limitation imposed by having to comply with this law, but still unfortunate that it has to apply to this, especially considering the nature of the initiative and the intended target group, ie foreigners, and those supporting them. However it is still difficult to avoid the sad irony of an award for multiculturalism, which is part of a wider programme – Open Kraków – which set’s out to make things easier for the International community, debarring non-Polish speakers from recognising good work, which is clearly lost on the authorities, making a mockery of both multiculturalism and openness. The Candidate Proposal – Application Form, is in itself a very formal lengthy document, and has from our first hand experience put people off, who lost interest on seeing the form, which they felt was too official. Perhaps consideration can and should be given to a less formal and more, dare we say, OPEN, procedure for the next edition of the Multicultural Ambassador procedure. It may be Polish law, but law, logic and common sense don’t always go hand in hand. You can find out more here. The Resolution can be found here, and the application in English – FOR INFORMATION ONLY !! – Can be found here. The Polish version of the nominee application form can be found here.